Striker Djibril Cisse gave manager Rafael Benitez a timely reminder of his prowess 10 days ahead of the Champions League final against AC Milan. Starting his first full game since October, Cisse won and scored a penalty and clipped home a low shot to convert Josemi's cross in the first half. Gareth Barry scored Villa's goal, powering in a shot past Scott Carson. Both sides hit the bar in the second-half, John Arne Riise for Liverpool and Luke Moore for Villa. Cisse's goals must have made uncomfortable viewing for MIlan Baros - the Czech Republic striker's last goal in the Premiership came back in the beginning of February. 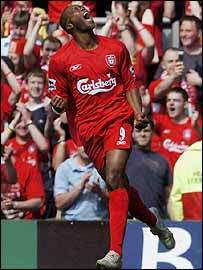 On the hour Baros came off the bench to replace Harry Kewell, though the two Liverpool strikers had few chances to link up. Good run out for Cisse - he may well have just played his way into the starting eleven in Istanbul! Before Cisse's devastating two-goal burst, Villa had looked the more likely to score, Carson pawing away Lee Hendrie's curling shot. A superb run and shot from Jamie Carragher that hit the side netting had the effect of shaking Liverpool out of their lethargy. Liverpool's other central defender - the much maligned Mauricio Pellegrino - also went close in the opening half with a backheel, Thomas Sorensen doing well to save from close range. In between those two chances Cisse grabbed his brace, his first goal the result of his willingness to chase a lost cause as much as Mark Delaney's reckless tackle. When Sorensen pushed away Kewell's shot there looked little danger as Delaney and Cisse chased the ball. But the Villa defender was surprised by the Frenchman's pace and as the Liverpool striker reached the ball first he was felled by Delaney. Cisse stroked the penalty to the right of Sorensen giving the Villa keeper no chance. Seven minutes later Cisse proved equally deadly when he rattled the ball into the same corner of the net after good work by Antonio Nunez and Josemi down the Liverpool right. Villa's goal had much to with Steven Davis' wonderful pass with the outside of his boot to Nolberto Solano on the edge of the box. The Peruvian headed across goal and Barry powered a shot past Carson. Barry's goal allied to some erratic defending from Pellegrino and Josemi gave Liverpool some nervy moments. Their shaking defending allied to Moore's enthusiasm saw the Villa striker hit the bar with a header, while the Villa striker also went close with a couple of shots. Not that Liverpool were solely content to defend their lead, with Riise's venomous shot striking the bar. Liverpool: Carson, Josemi, Pellegrino, Carragher, Warnock, Nunez (Finnan 79), Alonso, Biscan (Hamann 70), Riise, Cisse, Kewell (Baros 60). Subs Not Used: Dudek, Hyypia. Goals: Cisse 20 pen, 27. Aston Villa: Sorensen, De la Cruz, Delaney, Laursen, Barry, Djemba-Djemba, Solano, Davis, Hendrie (Samuel 48), Vassell (Moore 45), Angel (Cole 64). Subs Not Used: McCann, Henderson.